I won't go for a hike without slipping a Swiss Army knife into my pocket. 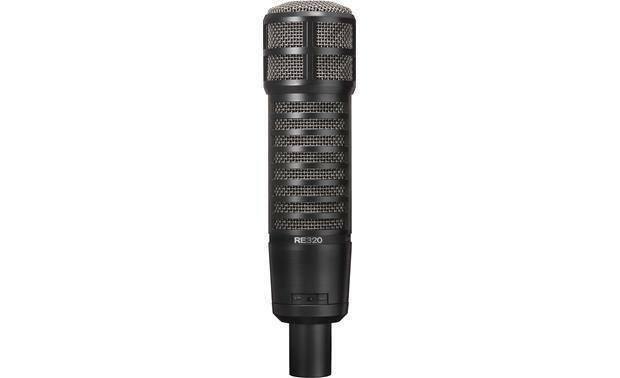 Electro-Voice RE 320 - The RE 320 features two different settings - one for kick drums, and one for vocals and instruments. By buying this product you'll earn up to 299 Rewards points. I won't go for a hike without slipping a Swiss Army knife into my pocket. Likewise, you shouldn't pack your gear for a gig without including mics that have the versatility to handle whatever might come up. Electro-Voice's RE 320 dynamic microphone is a tool you can count on — whether you're miking a singer or an instrument, this mic has the chops to handle almost any situation. The "Dual Personality" switch lets you engage either of two distinctive performance curves. Flip it to the left and the equalization is optimized for use with kick drums, with some serious low-end punch that'll really bring your kick out in the mix. Flip to the right and you'll engage a natural-sounding curve that's optimized for vocals, horns, and a variety of other instrumental applications. Whichever way you go, the RE 320's Variable D capsule minimizes the 'proximity effect" to ensure consistent tone even when the source moves off-axis. A neodymium magnet ensures fast response and excellent detail. And noise won't be an issue, thanks to this mic's humbucking coil — it effectively guards against hum and EMF interference. Overview: The Electro-Voice RE-series is designed to deliver consistent, high quality performance. 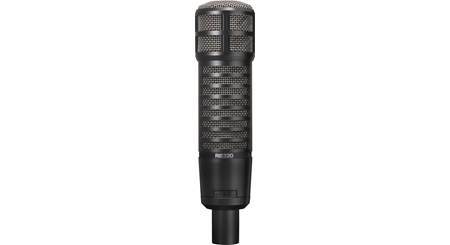 Based on the classic RE20 and RE27N/D, the RE320 is a hybrid microphone with a neodymium magnet which creates higher output with faster transient response and greater high-frequency detail. This cardioid dynamic microphone is ideal for broadcasters and voice-overs, as well as voice and instrument use during live music and stage performances. The RE320 comes with a sturdy swiveling stand clamp, a 5/8"-to-3/8" thread adapter, and a padded, zippered storage case. 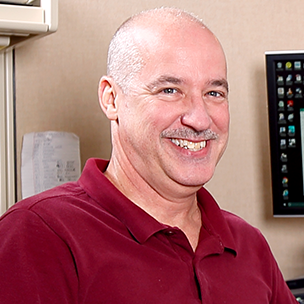 Variable-D Technology: Typically, directional microphones with cardioid, super-cardioid, or hyper-cardioid pickup patterns generate increased low-frequency performance when used close-up. When the distance between the microphone and the source is extended, this "proximity effect" is lost, drastically changing the overall sound. Electro-Voice's exclusive Variable-D technology utilizes dual ports and precisely placed interference ducts at set distances to significantly reduce the "proximity effect", and ensure the same frequency response at up to 180° off-axis as if the source was nearly on-axis. This helps when the announcer, vocalist, or instrumentalist moves around while addressing the microphone. Cardioid Pickup Pattern: The RE320 has a true cardioid polar pattern for maximum gain before feedback, a voice-tailored frequency response, and no coloration at 180° off-axis. 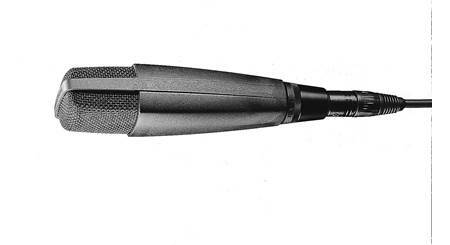 Dual Voicing Switch: The microphone has a 2-way switch that lets you choose from two response curves. The Generic curve features an essentially flat response from 45Hz to 18,000Hz, and delivers clear, natural, and lively articulation of vocals, acoustic instruments, and amplified instruments. The "Kick" curve can be used for kick drums and other percussion instruments, with rock-solid tone, punch, and attack. It has a frequency response of 30Hz to 18,000Hz with an extended low frequency sensitivity, a low-mid dip (-4.5dB) at 380Hz, and added boosts at 2,800Hz, 4,200Hz, and 7,200Hz. Construction: Like the RE20, the RE320 is made with a sturdy steel housing, and features an internal element shock-mount to reduce the pickup of mechanical noise. It is internally shielded with the same "hum-bucking" coil as the RE20 and RE27N/D to prevent unwanted noise. 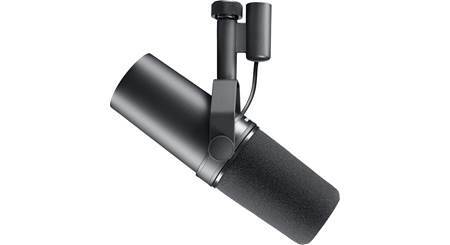 An integrated blast filter covers all acoustic openings on the microphone, and the heavy-duty pop filter eliminate the worry of plosives ("P-pops") or excessive sibilance. This allows the singer or announcer to perform with their lips almost touching the grille screen. The filter also helps to reduce contact noise. The RE320 comes with a semi-gloss black finish. 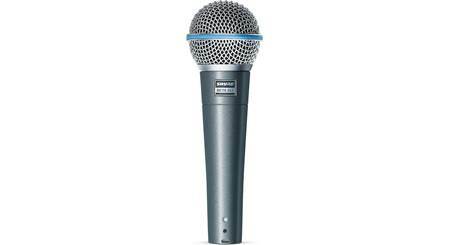 Dimensions: Diameter 2.144", Length 8.573"
Searches related to the Electro-Voice RE 320 Dynamic microphone for vocals and instruments.